Jeffery “Jeff” Miles Hares age 57, lifelong resident of Palmdale, California passed away at his home of natural causes the evening of Tuesday, August 28, 2018. Jeff was born in Lancaster California, the third child and only son of Bonnie and James “Jim” Hares. As a child Jeff attended Sage Elementary School and Palmdale High School. He played Youth Football, Little League Baseball, skateboarded, rode bikes and explored the desert. But by far Jeff’s favorite pastime was riding motorcycles. 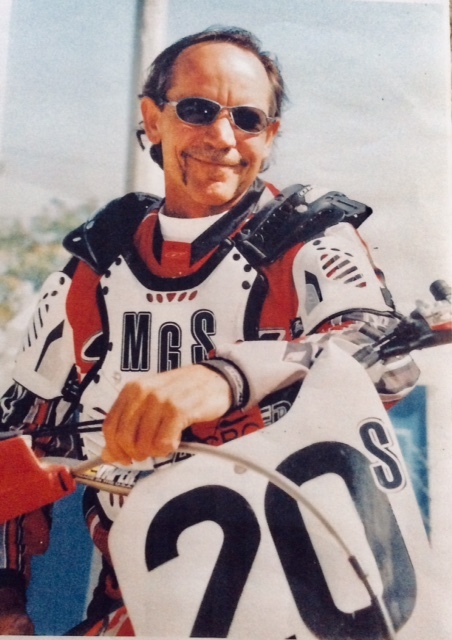 Jeff was born into a family of motorcycle riders and enthusiasts, but caught the “racing bug” himself at age 7 when he received his first motorcycle, a bright red Yamaha J60. Riding and racing were in Jeff’s DNA...he was born to race and loved to ride. In 1987 Jeff married Wendy Herbert and together they have one daughter, Brandi Hares, born December 8, 1989. Brandi also learned to love and race motorcycles at an early age, just like her father and grandfather before her. Jeff’s lifelong riding and racing included his J60, 125, 360, 250, 450, and 500cc class bikes, as well as a bit of side car racing. Jeff eventually ended his racing career competing in the Senior Expert Class. Although no longer racing, Jeff continued to enjoy riding mountain bikes and motorcycles, coming full circle by recently purchasing another bright red bike, a Honda 250. He also enjoyed working on and modifying motorcycles. Jeff is survived by his mother Bonnie Hares of Lake Elizabeth CA; father James “Jim” Hares of Palmdale, CA; daughter Brandi Hares of Rosamond, CA; his four sisters-Michelle Nielsen of Littlerock, CA, Theresa Hares of Carlsbad, CA, Kathy Gamby of Rouge River, OR, and Shannon Easter of Modesto, CA; 5 nephews and 2 nieces, numerous cousins, great nieces and nephews, and a lifetimes worth of friends. He was much loved and will be dearly missed by all. Please join us for a Celebration of Life in honor of Jeff on Saturday, September 29, 2018 at 1:00pm at Marie Kerr Park-West, 39700 30th Street West, Palmdale, CA.